CSIRO and Olex Australia (now part of Nexans, the world’s largest manufacturer of electrical cables) developed a multicore cable that maintains circuit integrity for two hours in temperatures greater than 1000°C. Fire rated Pyrolex® Multicore Ceramifiable®, as it is known, turns plastic into a solid ceramic on exposure to extreme heat. 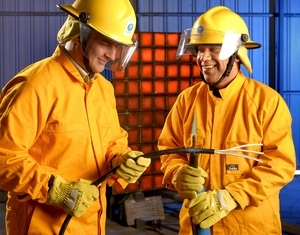 Working closely with Olex, CSIRO developed insulation that met stringent fire safety standards (a successful fire test for multicore cables being significantly more difficult than for single core) but which Olex could manufacture using existing equipment. Photographer : Mark Fergus on September 29 2008.